This archive was designed by Richard Holding in the Digital Humanities team at the University of Exeter. The site uses Omeka software developed by the Roy Rosenzweig Center for History and New Media, George Mason University. Advice on digitisation for this archive was offered by Gary Stringer, Technical Manager and Researcher, College of Humanities and Gemma Poulton, Special Collections, Library, University of Exeter. The digitised materials were selected by members of the History Group and tags were created for all digitised items by Will Barrett. 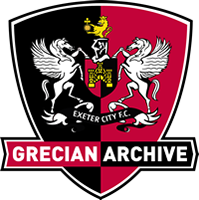 This archive would not exist without the hard work of a number of Exeter University students who have been collaborating with the Trust since 2013 to digitise Exeter City Football Club's archival collections. These include the following interns, who between 2013 and 2016 worked under the supervision of Will Barrett: Rebekah Cunningham, Sophie Davies, Rachel Edmundson, Katherine Emery, William Haggerty, Emily Lawry, Hannah Maisey, Sam Marshall, Lucy Macguire, Fred Morton, Alexander Payne, Jack Schofield-Newton, James Riddiford, Jonty Sutherland, Ryan Turner, Isobel Williams. A big thank you also goes to Rachel Wheeler in the Employability Office at the University of Exeter for assisting us, year after year, in locating the interns. In 2014 and 2015 Exeter City Football Club Supporters Trust was a partner in Grand Challenge, run by University of Exeter. Students who helped digitising in 2014 were: David Holt, Peter Sawers, and Edward Withers, all supported by postgraduate researchers Will Barrett, Paschalis Gkortsilas and Edward Taylor. Students who helped digitising in 2015 were: Therese Branch, Sally Dixon, Nemanja Drobac, Namuun Enkhtur, Domininc Green, Andrew Holden, Nikita Kuklya, Anna Popova, James Riddiford, David Smeeton, all supported by postgraduate researchers Will Barrett and Paschalis Gkortsilas. This archive has been supported by a number of individuals who have generously provided us with materials for digitisation. Among these are Alan Banks, Julie and David Mitchell, Jimmy Giles, the Uzzell family, the Pym family. We are grateful to Martin Weiler, Paul Farley, Lewis Jones and Aidan Hamilton for advice on how best to reflect the ECFC community's wishes in this archive.